These holiday lodges at South Lakeland Leisure Village near Carnforth offer an exclusive and luxurious countryside getaway. With every creature comfort catered for you can be sure of a relaxing stay. All log cabins feature a splendidly appointed lounge with dining area, fully fitted bathroom and kitchen, double glazing and central heating. 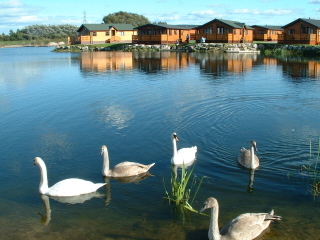 The luxury pine lodges sleep up to 6. Guests can enjoy full use of the brand new facilities on park at Pure Leisure Club. South Lakeland Leisure Village nestles amongst the rolling green countryside of the borders of the Southern Lake District and Yorkshire Dales, on the doorstep is the Silverdale and Arnside area of outstanding natural beauty. It is just five minutes drive from junction 35 of the M6. Many of the luxurious lodges are situated on the edge of the lake and the quality furnishings and fixtures which are found in all our lodges ensure the comfort that you would expect from today’s modern lifestyle. 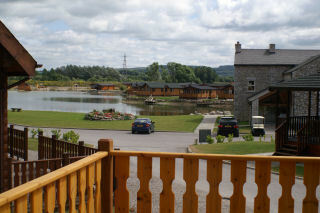 Central heating and double-glazing are standard and all the lodges are fully insulated. Remember that this could be your holiday home for 11 months of the year so it is very important to us that you have a real space tailored to your requirements. South Lakeland Leisure Village has been conceived with a strong commitment to conservation of the local flora, fauna and wildlife, while providing the facilities to be expected of a park of this standard. The lodge itself is brand new three bedroom (double with shower room/toilet ensuite and two twin bedrooms) plus another bathroom with bath, toilet and wash basin. There is an open plan lounge and dining room, which features a fireplace with electric fire and comfortable furniture. There is also a flat screen TV with freeview box, DVD player and CD player with radio and cassette player. Fully equipped kitchen with electric oven and gas hob, fridge/freezer, dishwasher, microwave oven and toaster. There is a private balcony with access from the lounge and patio furniture. Parking is available alongside the lodge.